Ski Bike Junkie: Fetish? No. Obsession? Maybe. A couple weeks ago, Adam was out on a tour in new boots that didn’t fit quite right. He was suffering badly by the time we got to the car, and this is a guy who does things like riding White Rim on back-to-back days for fun. So you know it hurt. I’ve had my own share of challenges finding ski boots that fit, and at one point it almost drove me to take up snowboarding. Almost. I shudder to think about it. My point is that when it comes to adventure sports, if you’re feet aren’t happy, you aren’t happy. I just wanted to let you know that I did see your comments about ultra light ski socks. I’m glad you’re enjoying the Lifestyle socks in your boots but want to make sure you have a chance to give our PhD Ski Ultra Light a shot. These socks feature the WOW Technology for comfort and durability and 4 Degree Fit System for the unparalleled fit you’ve experienced in our cycling socks. These are my go to sock on the mountain and I think you’ll enjoy them too. I’m sending 3 pair your way and you should see them soon, so keep an eye on your mailbox. Give me a shout if you have any questions. I wore the PhD Ski Ultra Light socks yesterday and the day before, and they’re wonderful. The fit is outstanding—they stay in place with no bunching or rubbing. They’re super thin, which I like (they also make thicker versions if thin’s not your thing), so the feel and responsiveness in my boots is uncompromised. And they’re warm. Even when they got a little sweaty (which happens if you’re trying to catch Ben on the climb), they didn’t feel cold, damp, or clammy. 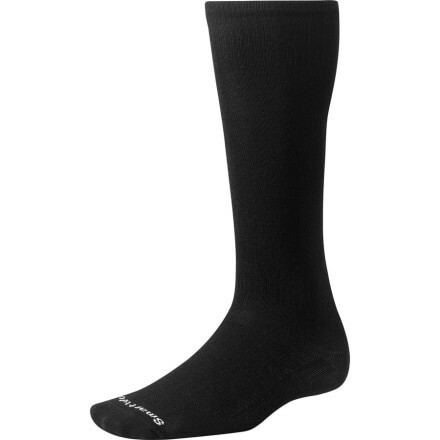 Plus they’ve got the Smartwool feel, which I just find comfortable, and which is why I wear Smartwool socks nearly every day (I have about 17 pairs), whether on skis, bikes, hiking, or just at the office. Adam was in a pair of these socks yesterday as well. And between the socks and some new footbeds, his dogs weren’t barking, and he was a happy skier. As an added bonus, since I didn’t ski in my lifestyle socks, I had a clean, dry pair to put on when I was finished and got to enjoy wearing those—for their intended purpose—for the rest of the day. My wife asked me if she could have them since they are, after all, ladies’ socks. I told her no. But maybe I’ll go buy her some of her own. Because I love my wife, and I want her feet to be happy, too. Those PhD socks, and the foot bed made all the difference. I think this makes you a pro skier. Most of the people I know who get free stuff are pros. Actually, I think it would mean I'm a pro blogger. Nobody from Smartwool has ever seen me ski. If they did, I'd probably have to give back the socks. That is the great secret. A good blog is more valuable than good legs when it comes to sponsors. Having both is ideal. But for now I am happy with the blog.